The Best Artificial Intelligence blogs from thousands of top Artificial Intelligence blogs in our index using search and social metrics. Data will be refreshed once a week. Also check out Artificial Intelligence Podcasts and Artificial Intelligence Videos from Best 10 Artificial Intelligence Youtube Channels. Artificial Intelligence newsletter is a comprehensive summary of the day's most important blog posts and news articles from the best Artificial Intelligence websites on the web, and delivered to your email inbox each morning. To subscribe, simply provide us with your email address. Boston, MA About Blog AI Trends is the leading industry media channel focused on the business and technology of AI. It is designed to keep executives ahead of the curve. Rockville, MD About Blog Artificial Intelligence News. Everything on AI including futuristic robots with artificial intelligence, computer models of human intelligence and more. Facebook fans 1,759,937. Twitter followers 207,250. Cambridge, MA About Blog MIT News is dedicated to communicating to the media and the public the news and achievements of the students, faculty, staff and the greater MIT community. Facebook fans 1,106,546. Twitter followers 955,386. About Blog This reddit shares artificial intelligence – news, research and generally interesting links. Facebook fans 1,208,607. Twitter followers 574,418. About Blog Chatbots Magazine is the place to learn about Chatbots, AI, NLP, Facebook Messenger, Slack, Telegram, and more. Facebook fans 8,676. Twitter followers 10,984. San Francisco, CA About Blog Best place to learn about Chatbots. This blog shares the latest Bot News, Info, AI & NLP, Tools, Tutorials & More. Facebook fans 2,021. Twitter followers 13,710. Seattle, WA About Blog Follow this blog for latest news on Artificial Intelligence. Amazon Web Services (AWS) delivers a set of services that together form a reliable, scalable, and inexpensive computing platform “in the cloud”. Facebook fans 196,213. Twitter followers 1,145,767. About Blog IBM Developer offers Open source, code patterns, tutorials, meet-ups, challenges, mentoring, and a global coding community all in one place. Follow us to keep up with articles on Artificial Intelligence. Facebook fans 47,551. Twitter followers 91,911. About Blog The AI podcast hosts accessible, big-picture conversations at MIT and beyond about the nature of intelligence with some of the most interesting people in the world thinking about AI from the perspective of deep learning, robotics, AGI, neuroscience, philosophy, psychology, cognitive science, economics, physics, mathematics, and more. Facebook fans n/a. Twitter followers 16,262. Europe About Blog Stories by Francesco Corea on Medium. AI technologist and data strategist. I simply post about everything I read and write on AI, datascience, machinelearning, bigdata, vc, cvc. About Blog Smartech Knowledge Center is an AI-Powered Growth Marketing Platform which helps you Listen to your customers, Analyse their behaviour, and Converse with them. Facebook fans 156. Twitter followers 135. About Blog The mission of the AI Time Journal is to divulge information and knowledge about AI, the changes that are coming as well as the opportunities that arise in a world dominated by AI. Santa Clara, CA About Blog Get the latest news about technologies, deep learning, PC gaming market and more. Facebook fans 2,233,002. Twitter followers 1,367,519. About Blog AITopics is a mediated information portal provided by The Association for the Advancement of Artificial Intelligence, with the goal of communicating the science and applications of AI to interested people around the world. San Francisco, CA About Blog Artificial Intelligence & Machine Learning will radically change the way we work and live. Machine Learnings covers the most remarkable news in AI, so you’ll feel prepared for the future. Facebook fans n/a. Twitter followers 3,196. About Blog A great blog covering Artificial Intelligence news, research, people in AI & companies in AI, as well as great A.I. books and conferences. Loads of videos and links to great artificial intelligence resources. Facebook fans 350. Twitter followers 82. About Blog Comprehensive up-to-date coverage for artificial intelligence, aggregated from news sources all over the world by Google News. Facebook fans 22,005,894. Twitter followers 212,834. Seattle, WA About Blog The core mission of The Allen Institute for Artificial Intelligence (AI2) is to contribute to humanity through high-impact AI research and engineering. Facebook fans 1,584. Twitter followers 95. San Francisco, CA About Blog Everything pertaining to the technological singularity and related topics, e.g. AI, human enhancement, etc. Sunnyvale, California About Blog Baidu Research brings together global research talent to work on AI technologies in areas such as image recognition, speech recognition, high performance computing, natural language processing and deep learning. Facebook fans 7,031. Twitter followers 37,809. San Francisco, CA About Blog Articles From The Team Behind Archie.AI - Medium. The Artificially Intelligent Data Scientist to help you make better decisions. Facebook fans 601. Twitter followers 965. Prague, Czech Republic About Blog AI Roadmap Institute Blog mission is to accelerate the search for safe human-level artificial intelligence by encouraging, studying, mapping and comparing roadmaps towards this goal. Facebook fans 166. Twitter followers 188. Berkeley, CA About Blog The Berkeley Artificial Intelligence Research (BAIR) Lab brings together UC Berkeley researchers across the areas of computer vision, machine learning, natural language processing, planning, and robotics. Facebook fans 5,827. Twitter followers n/a. About Blog OpenAI is a non-profit artificial intelligence research company. Their mission is to build safe AI, and ensure AI's benefits are as widely and evenly distributed as possible. Facebook fans 8,531. Twitter followers 286,802. London, UK About Blog DeepMind is the world leader in artificial intelligence research and its application for positive impact. They are on a scientific mission to push the boundaries of AI, developing programs that can learn to solve any complex problem without needing to be taught how. Facebook fans 315. Twitter followers 181,199. Boston, MA About Blog The most advanced machine learning platform built by the world's best data scientists. Mission is to help data scientists of all levels build and deploy better predictive models, faster. Facebook fans 3,388. Twitter followers 11,406. San Mateo, CA About Blog Inbenta is a leader in natural language processing and artificial intelligence for customer support, e-commerce and conversational chatbots, providing an easy-to-deploy solution that improves customer satisfaction, reduces support costs, and increases revenue. Facebook fans 700. Twitter followers 2,524. New York, NY About Blog Clarifai is an artificial intelligence company that excels in visual recognition, solving real-world problems for businesses and developers alike. Facebook fans 2,928. Twitter followers 661. Ahmadabad City, India About Blog Maruti Techlabs was founded in 2009 by a team of young, highly skilled, and highly motivated professionals with the aim of using their diverse and extensive experience in the IT industry to help businesses solve IT-related problems. Facebook fans 459. Twitter followers 2,547. Rockville, MD 20852 About Blog Expert System is a semantic intelligence company that creates artificial intelligence, cognitive computing and semantic technology software. About Blog Playment is a fully managed data labeling platform generating training data for computer vision models at scale. They empower companies in the Autonomous Vehicle, Drones, Mapping, and similar spaces with high precision annotation services - No matter how complex. Facebook fans 1,435. Twitter followers 791. New York, NY About Blog TOPBOTS create and source the best content about applied artificial intelligence for business. Facebook fans 1,076. Twitter followers 10,515. About Blog Artificial Solutions is the leading specialist in Natural Language Interaction (NLI), a form of Artificial Intelligence that allows people to converse with applications and electronic devices in free-format, natural language, using speech, text, touch or gesture. Facebook fans n/a. Twitter followers 2,558. Hong Kong & San Francisco About Blog Sentient operates distributed artificial intelligence on an unprecedented scale, routinely running multiple distributed AI jobs, on millions of AI processing nodes, producing actionable results validated on large and complex data sets. Facebook fans 6,470. Twitter followers 1,802. Facebook fans 2,747. Twitter followers 291. Berkeley, CA About Blog MIRI's artificial intelligence research is focused on developing the mathematical theory of trustworthy reasoning for advanced autonomous AI systems. Facebook fans 17,729. Twitter followers 21,756. About Blog Iris AI Blog with regular updates, news, articles and interesting information on AI. Iris AI is an Artificial Intelligence helping entrepreneurs and innovators navigate the world of science. Facebook fans 8,351. Twitter followers 2,641. Prague About Blog GoodAI, they are building general artificial intelligence, a software program that can learn, be creative, and adapt to the environment in the way a human does. Their artificial intelligences will respond to what they perceive, and will interact with their environment to achieve goals defined by human mentors. Facebook fans 1,459. Twitter followers 7,212. About Blog 1redDrop is built on the premise that anyone can make a difference. All it takes is one red drop in a blue ocean to turn it red - it's the intensity that counts, not the size of the drop. Our collective professional experience of over 50 years puts us in a unique position to have a strong opinion on what's going on in the world of technology. We believe we can truly make a difference to the world of business and finance but 1redDrop at a time. Facebook fans 204. Twitter followers 12. Noida, India About Blog Binary Informatics is a Software Development Company and We create world-class value, inspire customers and enable them to grow and create intensify environment for the employee to learn, and become the leaders of the tomorrow. Facebook fans 142. Twitter followers 782. Seattle, WA USA About Blog Mighty AI enables machine learning teams to generate accurate and diverse annotations on their datasets to train, validate, and test their algorithms. 1 State Street Plz 34th Floor About Blog Fusemachines' blogs provide its users with a platform to stay aligned with the latest AI and sales trends. The updates layout a sketch enabling the users to map out their basic necessities on factual data and past data content prior. Facebook fans 4,209. Twitter followers 2,653. About Blog Singularity Weblog is a conversation about exponential tech, accelerating change, artificial intelligence and ethics because technology is not enough. Facebook fans 2,855. Twitter followers 7,897. Lexington, MA About Blog As the largest and most powerful technology association in the region, MassTLC’s mission is to accelerate growth and innovation in the Massachusetts technology industry. Follow us to keep up with articles on artificial intelligence from MassTLC. Facebook fans 1,482. Twitter followers 9,027. London About Blog Artificial Lawyer is a blog dedicated to new legal technology. The main focus is artificial intelligence technologies. Facebook fans n/a. Twitter followers 2,150. Irvine, CA About Blog MarkTechPost reports related subjects such as artificial intelligence, blockchain technology, and healthcare. Facebook fans 4,834. Twitter followers 2,607. Chicago, IL About Blog Our blog consists of education material, tech news, descriptive technology, and startup theories. We try to write blogs anyone in technology can relate to. About Blog AI ML MarketPlace is platform to Connect with Artificial Intelligence Startups/ AI ML Tech Firms, Practitioners and Researchers with different brands and industries. AI ML MarketPlace not only provides various AI solutions on our platform, You can benefit through finding right talent for your orgination AI ML needs and attend Industry AI Events. NYC, London, Paris, Dallas About Blog Artificial Intelligence software for the enterprise that automates the writing or written reports through the power of natural language generation. Facebook fans 217. Twitter followers 1,453. Amsterdam About Blog EDIA's blog is everything education and artificial intelligence. They blog about the future of AI in education, different events, and disruptive trends that impact education publishers, universities and edtech players. Facebook fans 63. Twitter followers 217. About Blog AI Weekly is a weekly collection of the best news and resources on Artificial Intelligence and Machine Learning. Facebook fans n/a. Twitter followers 2,304. Cleveland, OH About Blog Get the latest exclusive content on AI, machine learning, cognitive computing and related AI technologies—created by marketers for marketers. A content hub that explores the current and future potential of AI, machine learning, deep learning and cognitive computing to transform marketing. Facebook fans 43. Twitter followers 380. NV About Blog Quertle is a Biomedical Big Data leader. Quertle uses its BioAI Platform for its own products, such as Qinsight & Qexplorer as well as custom applications. Facebook fans 254. Twitter followers 477. Global About Blog Rainbird: Artificial intelligence enables the modelling of a new generation of problem solving tools, accessible to both agents and customers. Facebook fans 221. Twitter followers 3,536. Sunnyvale, CA About Blog My name’s Lorien Pratt, and I’m Chief Scientist and co-founder of Quantellia. As part of this work, I’ve been promoting decision intelligence in a number of ways over the years. Facebook fans n/a. Twitter followers 486. Montreal, Canada About Blog Follow this blog for Curated Tech News & Insights: fintech, martech, cybersecurity, artificial intelligence & more. Facebook fans n/a. Twitter followers 3,582. Maryland, USA About Blog A blog about issues arising at the intersection of Artificial Intelligence technologies and the law. About Blog The Computational Intelligence Blog covers all topics related to computational intelligence. The major focus is on artificial neural networks, evolutionary algorithms, fuzzy systems and the applications of these methods. Calls for papers, new journals, tutorials and software are also covered. Cambridge, MA About Blog The Massachusetts Institute of Technology's Computer Science and Artificial Intelligence Laboratory (CSAIL) conducts research in all areas of computer science and AI, such as robotics, systems, theory, biology, machine learning, speech recognition, vision and graphics. Facebook fans 22,011. Twitter followers 59,821. Slovakia About Blog Student StarCraft AI Tournament is an educational event, first held in 2011. It serves as a challenging competitive environment mainly for students of Artificial Intelligence and Computer Science. They are submitting the bots programmed in C or Java using BWAPI to play 1v1 StarCraft matches. Naples, Florida, USA About Blog A Subject Tracer™ Information Blog developed and created by Internet expert, author, keynote speaker and consultant Marcus P. Zillman, M.S., A.M.H.A. for monitoring artificial intelligence resources and sites on the Internet. Facebook fans n/a. Twitter followers 1,288. About Blog AI: Artificial Intelligence, Embedded Systems, Self Organizing Systems, Recurrent Systems, Hierarchical Systems, ARM Systems, Learning Paradigms, Neural Networks, Connectionist Systems, Software, Algorithms. 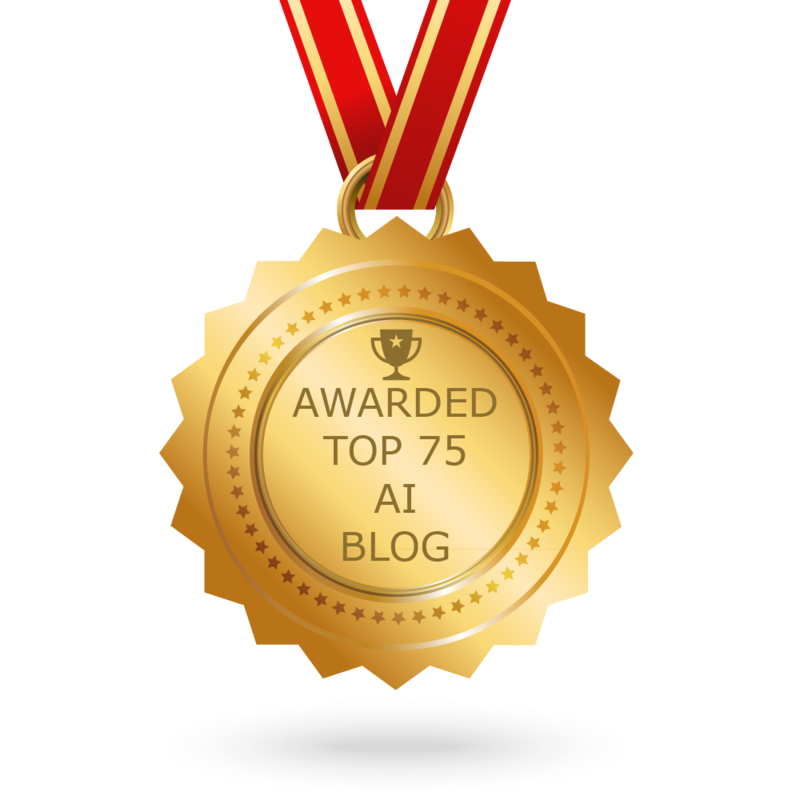 CONGRATULATIONS to every blogger that has made this Top Artificial Intelligence blogs list! This is the most comprehensive list of best Artificial Intelligence blogs on the internet and I’m honoured to have you as part of this! I personally give you a high-five and want to thank you for your contribution to this world.